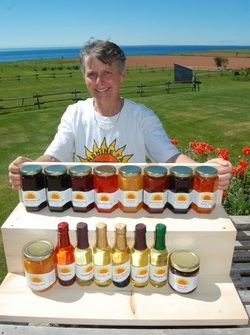 SUNSHINE FARM in Prince Edward Island was created in 2000 by Ina Proeber. This 5-acre farm, overlooking the Northumberland Straight on the South-East corner of Prince Edward Island is where she grows the ingredients for her quality delicious sweet and savoury products. Ina grew up in a family where preserving the bounty of the season was a cherished ritual during the summer and fall. Opening a jar of jam or pickles when a winter storm was howling outside is a memory that inspired her to continue the tradition. She started with making Salsa due to a bumper crop of tomatoes. In 2003, she won 3rd prize at the Royal Winter Fair for her medium Salsa. Over the last 19 years, her business grew to a line of over 160 different products made without artificial additives or preservatives. Please visit SUNSHINE FARM at the Charlottetown Farmers Market on Belvedere Avenue, every Saturday year round between 9am and 2pm. From July to September we are also at the Downtown Farmers Market on Queen Street in Charlottetown, hours are 11am to 4pm. Please contact us about other location where our products are available and special events we attend. Some days Ina Proeber’s typically spotless kitchen is just jam-packed. This is during prime preserving time when she’s busily putting up a spread of homemade jams, jellies, bread dipping oils, flavoured oils and more. It’s all part of her line of 150 products for her company, Sunshine Farm, that she sells at locations such as the newly renamed Friday Co-op Farmers Market on Queen Street in Charlottetown, which opens for the summer season on Friday, June 29. “I called it Sunshine Farm because it is sunnier out here. Strangely, it may be raining in Murray Harbour and we have sun out here, so I thought it was an appropriate name,” smiles Proeber from her Guernsey Cove property. Originally from Germany, she immigrated to British Columbia in 1995 and after building a potential retirement home in Guernsey Cove in 2000 she moved there fulltime two years later. The jams themselves have deep roots, stemming back in time through her maternal family line. “My mom was always putting things away, preserving everything in the fall and that’s how I learned,” Proeber says. The backyard of her childhood had a few quince trees, some gooseberry bushes, currants and more, which made for easy gathering. So when she purchased her Prince Edward Island property, which overlooks the Northumberland Strait, she immediately put plans into place for an orchard and a bevy of berry bushes and sourced out some prime wild spots for cranberry picking and such. She also sources product from other local growers, but the exotic ingredients, such as clementines, are imported. Summer and fall are prime picking times for Proeber, who freezes her produce and then in the winter months works her preserving magic to transform them into jams, jellies, marmalades, flavoured bread-dipping oils, pickles and more. She also makes wine jellies, which use wines from Rossingnol Estate Winery in nearby Little Sands that are sold onsite there. Gradually Proeber progressed from a typical Bernardin jar with a hand-printed label to a more personalized product package. She also developed her Sunshine Farm logo and Do Yourself a Flavour slogan. “It’s been a step-by-step process; it’s been 12 years now since I started, and every year something changes,” she says. Over the years she has presented her products to the public at local flea and farmers’ markets, the most recent of which is the Friday Co-op Farmers’ Market on Queen Street. “I cook everything from scratch . . . . I was always very interested in healthy food and cooking healthfully and using healthy ingredients, and that’s part of it — not using that (store-bought) salad dressing and those things,” says Proeber, who recently introduced a berry sauce in various flavours that can be poured over ice cream, waffles or pancakes. “It’s fun to do something new from time to time,” she says. And it’s always a learning experience. After years of experimenting, Proeber is still discovering new jam-making tricks, like not making jellies on a rainy day because it wil not set properly due to the air pressure.